Valve-like overdrive that works well with single notes or chords. Sweet sustaining overdrive. Dual input/output options. 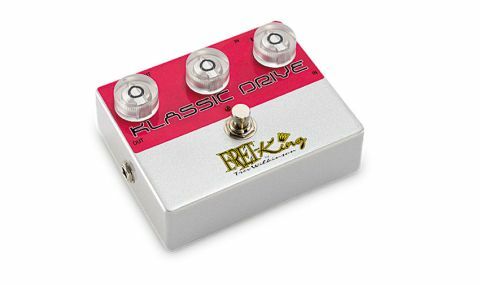 The Klassic Drive is Fret King man Trevor Wilkinson's take on 'low-gain' overdrive pedals such as the revered Klon Centaur, from where it takes its inspiration - hence the spelling. "The pedal is capable of a range of overdriven sounds from just beyond clean and up"
With a classic three-knob array of gain tone and level, the pedal is capable of a range of overdriven sounds from just beyond clean and up. Should you require a clean-ish boost, you can get it by turning up the level with the gain knob at minimum, but it's this knob that brings in sweet sustaining overdrive. Its sonic variation is courtesy of a tone knob, which covers a practical range with plenty of top end should you need it, getting strident but not nasty. This is a pedal that can work with really clean amps, giving them an alternative overdriven channel, or can be used with an already overdriven amp to just add more. By the same principle it works really well in conjunction with either of the (recently reviewed) Fret-King Power or Clean boost pedals, driving it even further and adding an extra layer of versatility.